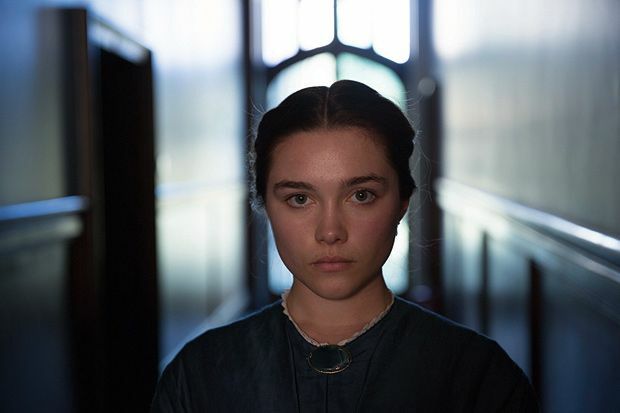 Florence Pugh astonishes with an imposing performance as Katherine, a young bride shackled to a callous middle-aged man, that is by turns chilling and droll. Pugh (The Falling) shifts between wild-eyed wickedness and controlling command with a cool and swift precision that punctures the stillness of the grand manor house she is left to watch over when her husband is called away on business. Left to her own devices she begins a passionate affair with stable hand Sebastian (Cosmo Jarvis, who excels at steely stares and conveying crumbling emotion). First-time director William Oldroyd inserts arresting imagery into this adaption of Lady Macbeth of the Mtsensk District, an 1865 Russian novel by Nikolai Leskov. Striking visuals such as the naked, muscle-bound torso of Sebastian lying atop his fully-clothed mistress are intricately constructed. Oldroyd confidently delivers beautifully symmetrical and meticulous compositions and directs his players with assurance. All the actors hold their own, with special mention to Naomi Ackie as Anna, an ill-treated maid who bears the brunt of Katherine's dreadful deeds. When Anna turns mute with guilt after a horrific event, Ackie expresses the torturous gravity of her situation with trembling conviction, bringing a stirring humanity to proceedings. Katherine's ambitious quest for power knows no bounds and whether she's rudely rolling her eyes at polite society while carefully stirring her tea, battering men over the head with steel pokers, or coldly manipulating her way out of trouble, she is a fascinating character to behold. The screenplay allows for humour and fleeting tender moments too, especially with the arrival of a young child who Katherine strikes up a relationship with. While Katherine's actions spiral out of control, Oldroyd and writer Alice Birch maintain a restrained mood in keeping with the 19th century setting. Together this talented duo have crafted a quietly and compulsively watchable debut that's sure to send shivers down your spine. Screened as part of the London Film Festival 2016. General release TBC.